…the best pick your own strawberries in Richmond! Hours: 8 a.m.-8 p.m., daily. Free admission and free parking at Gallmeyer Farms! 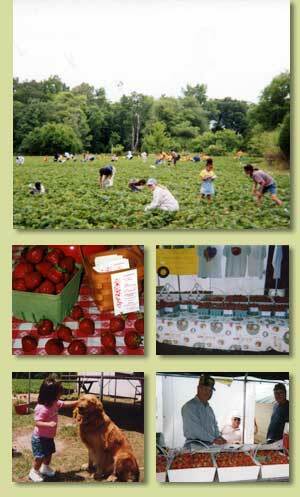 The Berry Patch in Richmond Virginia offers pick your own strawberries with NO COVER CHARGE and free containers! You can pick your own strawberries for $2.99 per lb. We also have pre-picked strawberries available for $3.99 per lb. Gallmeyer Farms strawberries are sweet and ready for the tasting! We have other, available, Virginia grown spring vegetables. We also sell bottled water and sodas as well as our famous Gallmeyer Farms local, raw honey harvested from our own hives. We offer free hayrides every day. Also children can enjoy the play area where toys are supplied. Bring your own lunch to enjoy in our shaded picnic area. Gallmeyer Farms is a family farm, rooted in old fashioned, traditional methods and heirloom varieties. Taste and nutrition is what matters when it comes to what you eat, and what you feed your children. At Gallmeyer Farms it is ALWAYS FREE parking, FREE admission and FREE hayrides!